InCompass' Race Track Operations (RTO) system provides a unified approach to the management of data and technology at the racetrack, creating operational and economic efficiencies across departments. The racing office and horsemen's bookkeeper departments have direct access to the Equibase racing database and The Jockey Club pedigree database, which contain the most accurate, comprehensive and timely information available to the industry. Previously, tracks had no other choice but to access local databases that were limited in scope and out of date almost immediately after distribution. Users of the RTO system work directly in the central database, which eliminates the significant volume of file transfers that support racetrack activities. The central database also enables the sharing of dynamic data between individual departments, racetracks and racing circuits based on user-defined parameters. Users have full access to horse and trainer records from all tracks in North America to assist in stall allocations, hustling trainers for horses, race qualification during entry time, etc. Entries are qualified and weights are assigned at time of entry. This is only possible due to the direct connection into our central database where all allowances and historical race records can be processed. Our condition book template system allows you to write a race in seconds rather than minutes. Camera-ready condition books and stakes books are produced on demand and ready for production. We have built in hundreds of validations to prevent erroneous data at entry time rather than alerting users of problems later in the process. If these validations are overridden by your users an e-mail alert can be sent to the racing secretary and other designated staff to let them know what data was overridden. These include warnings for horses over certain ages, horses that have not started or worked out in a specified time period, horsemen that have never started at your racetrack, fillies in colt races, etc. The payoff for this error checking has been a time-savings of 1 to 2 hours in the time between making a program final and getting it out to your simulcast outlets. All file transfers are eliminated. The processes of building files, sending them to Equibase and then receiving them back from Equibase are eliminated. When you are ready to print a final, the horse, horsemen and past performance information is always ready. Horse lists such as starters, bleeders, vets, etc., can be shared locally, regionally, statewide, nationally and even throughout North America. Your racing office can have the ability to see horses on lists from other tracks to eliminate the chance of a horse on the vets list at another track entering at your racetrack. Horsemen name and silks management headaches are eliminated by the central database. Equibase maintains the list of names to eliminate duplicates and misspellings. This is a great asset when it comes time to create statistics. Silk descriptions are stored in the system to indicate the colors that an owner used his last time out at each track. Your operators can merely select the most descriptive silk text from a previous start rather than going through the repetitive task of keying hundreds of characters of data for every new owner. This is a great time-saver and eliminates spelling errors on the program. Stall applications are easily evaluated by using our central database. Every start for every trainer is at your fingertips. You enter the trainer and horses from a stall application and the system prints reports showing every start for those horses. The report highlights starts made at your racetrack versus starts made elsewhere to show which trainers are using your racetrack as a training ground and the ones that are actually running horses for you. New trainers to your racetrack are easily evaluated by looking at their racing history at other tracks. This system allows you to track all arrivals and departures from your stable area. The system can print barn area reports and stall lists to show which trainers have which stalls. Horses on the grounds by age, by trainer, total number on the grounds and ship in / out tracking reports are provided. Since the system has access to every past performance on every registered horse in North America, we have the ability to take a race condition and return horses in your area (up to 15 tracks at once) that are eligible for those races. This gives you the ability to pre-hustle races that may be more challenging to fill or to look at what-if scenarios to determine if a condition should be offered. Mobile Rundown is the initial offering on InCompass mobile and enables racing secretaries, assistant racing secretaries and designated racetrack executives to closely monitor the changing status of race entries on their smartphones. The app displays in real time the number of horses that have been entered in each race so that racing secretaries can see at a glance which races are made and which races need to be hustled. This tool alerts racetrack management of possible post time conflicts with pre-selected racetracks that might have similar post times. The system examines each racetrack selected and suggests an alternate post time so simulcast patrons are not forced to watch and wager on two races at the same time. Special events and televised races can be indicated in the schedule to alert other racetracks that these post times cannot be adjusted. A report showing historical post times vs. actual off times is provided to allow users to make choices based on a racetrack's history. This tool is provided at no charge to all RTO customers. After the overnight sheet is finalized, program proof and final copy are produced along with statistics pages for your fans. All documents are produced in camera-ready PDF format and ready for production. Everything can be accomplished by using Adobe Acrobat to arrange the program. A new upgrade was released in 2006 that creates and places all pages, insert advertising and filler pages and removes the need for any user interaction or desktop publishing skills. Your operator merely sends the completed document to a print device. All documents created in the racing office are pushed to your web provider as soon as they are marked final. These include condition & stakes books; stakes nomination past performances; overnight sheets; statistics pages for top 10 owners, trainers, jockeys and horses; facts and figures statistics and post position statistics. Entries and Results are sent to newspapers and media outlets in their custom format as soon as these items are final. This system services smaller media outlets that cannot afford or choose not to subscribe to the AP Wire service. Our experience shows that the easier that you make it for a newspaper to include your information without manual intervention, the more likely they will carry it each day. Give your gate crew the ability to keep real-time records of workouts, gate schooling, horse behavior and equipment carried via our Gate Crew and Schooling Module and a tablet PC with air card. The Web-based application can also function on a laptop or desktop computer for data entry later that morning. This software was developed in the field by gate crew personnel for ease of use and quick data entry. Features include access to a trainer's inventory of foal papers for named and unnamed horses, identification markings, tattoo and breeding information, and the ability to update schooling and gate activity in sets and/or individually, and it eliminates the need for hand-written log books that may become illegible or lost. All data is backed up automatically. Utilize empty white space in your programs by automatically inserting advertisements, historical facts and/or fillers. Easily maintain a customized ad library that will contain specific ads in either a text or graphic (jpg or tif) format. Each ad can be assigned a priority number so you can control the frequency of use, because some ads need to appear daily while others do not. The horsemen's bookkeeper system takes all race setup information from the racing department so no manual transfer or entry is required. The system is also configured to read data files from the USTA and CTA to pre-load races from their system for harness racing. Once the races are loaded into the system, the bookkeeper can enter the finish for each race. All standard deductions are processed automatically leaving the operator to merely generate daily reports. In the case of purse redistributions the system allows for the user to bring the race up, make changes to the finish positions and update — the system does all of the redistribution automatically. This process is very simple as it eliminates the antiquated process of posting and un-posting races. The Thoroughbred nomination process is simplified via our interface into the racing office application. When nominations close for a stakes race the bookkeeper can import the nomination list of owners and horses into the HB system and create nomination fees in one batch process. The system also generates and distills many of the transactions that occur at a track on a daily basis. It provides easy, one-step processing of all video and win photo charges generated for each race. By simply marking the horsemen you wish to charge, the system automatically creates all transactions in one step. Claims are processed and ownership changes are made immediately. All government reporting of 1099 data is automated and can be published directly to your web site, printed for mailing to the respective horsemen and electronically filed with the IRS. A powerful component of the Horsemen's Bookkeeper System is its ability to provide the necessary reporting to regulatory agencies. Reporting for racing commissions, breed organizations, horsemen's groups and the like are provided. To provide important operational information to management, the system automatically disseminates messages to management if validations are overridden; any unusual or 'out of the norm' activity is logged and identified in notices to your designated managers. Moreover, bank and check reconciliation processes are streamlined. The system can upload checks from the bank for easy reconciliation, and it prevents fraud by providing a 'positive pay bank file' to alert your bank to valid checks and their amounts. Check requests through the web are also accepted, working in tandem with InCompass Financial Services. Automate your Futurity and Stake payments with InCompass. Compile a list of races and futurity payment dates and you are ready to post payments for horses. Using the RTO Futurity Package, looking up horse names is easy because you have access to all horses in the Equibase database. Full search capability enables you to search by breed type, by name, or even by the dam name to locate unnamed foals. If the foal is still unnamed when selected, the new name will automatically appear as soon as the horse is officially named. Owner and trainer names are easy to find when the accounts are pulled in from the Horsemen's Bookkeeper system. Having access to addresses and phone numbers is a tremendous head start when printing reports, letters and labels. With horses nominated to each race, Nomination/Reminder letters can be customized to print on your track letterhead. After the Stake payments are processed, the system will print a report of non-payment horses to be disqualified. Use the automated "Disqualification" process to disqualify horses from each race. Print reports for horses disqualified by race or by owner. Listings of remaining horses are also available. Statements detailing payment records for each horseman can be printed for mailing, emailing or faxing. If you're already using the RTO Stall Allocation and Assignment process you're halfway there. Complete the process by using the Horsemen's Bookkeeper (HB) system to charge trainer accounts for stalls and mail out invoices and statements. Our setup enables you to invoice trainers for stalls based on either Stall Allocations or Stall Assignments and to easily add Dorm Room charges to the same invoice. Streamline your stall billing process with InCompass. Using the HB system, Stall Allocation/Assignment information is imported from the Racing System into the HB System, which eliminates dual entry. When creating invoices, you're one step ahead of the game as the majority of the horsemen accounts already exist in the HB system with trainer name and address information. When payments are submitted to the bookkeeper they can be deposited straight into the trainer's account to cover his stalls charges. myRacingOffice.com is a secure password-protected website through which horsemen can conduct and manage their business with the racing office more efficiently. Within myRacingOffice.com, horsemen can verify or amend their contact information, specify which participating tracks receive their contact information and request email receipt of a variety of racing office documents and notices from designated tracks as soon as they become available. These services are provided at no cost to racetracks or horsemen and additional services will be offered through the site in the future. 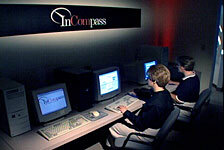 myRacingOffice.com also includes links to the InCompass Financial Services™ system, where horsemen can view and print their horsemen's bookkeeper statements, account balances and tax forms online. InCompass offers its racetracks the ability to accept requests for checks via the Internet directly into the RTO HB system. This product can save the horsemen a phone call or a visit to the bookkeeper's office. By simply logging in to their account, horsemen can request a check from the bookkeeper and wait for it to arrive in the mail. This product allows a horseman to login to a secure site where they can print their statements and check their available and total balances much like a bank statement lookup. This package has been very well received and is currently in use at over 30 tracks and horsemen associations in North America. The Pre-Race Veterinary Exam software allows examining vets to track the progress of a horse throughout their racing career. The system populates the screens with the races for the day and allows for entry of vet exams. This replaces the old card systems of the past. By using a tablet PC for data entry, all manual written exam information is eliminated. Desktop PCs can also be used where vets prefer to continue to hand-write their exams and have them entered into the system. The next time a horse runs, the exam history is printed on the exam sheets for each horse. This information can be shared with other jurisdictions so when horses move from track to track, their exam information follows them. The aim is to provide a history on each horse to allow a vet to determine if an ailment is new and should be watched carefully or is an old injury that has had no ill effect on the racehorse in the past. Racing and workout history is also provided to assist in making race day decisions on whether to allow a horse to run or not. InCompass now offers a simple method for tracks to maintain their simulcast calendar. Race dates for every Thoroughbred, Standardbred and Greyhound track are now maintained by InCompass, including cancellations and changes. This new feature enables a racetrack to indicate which tracks they will take during the month, and a calendar with post times and race dates can be generated in several formats. These include a calendar-style PDF, a download to Excel or an HTML version that can be posted on the receiving track's website. Jai alai events will also be maintained by InCompass, so a complete simulcast calendar can be maintained and printed at any time. The Railbird's Winners Sheets offer insightful comments and suggested wagers to help your fans make informed wagering decisions. It is designed to do the handicapping work for you using a sophisticated algorithm. It pays to know The Railbird. The Handicapper's Advantage race analysis provides a snapshot of your races, including speed and pace handicapping information and suggested wagers. Foreign language simulcast programs are currently offered in Spanish and Portuguese. They benefit racetracks and wagering outlets in the Caribbean and Central and South America licensed to simulcast North American Thoroughbred and Quarter Horse races, as well as domestic tracks and wagering outlets that need to supply non-English programs to their customers. The programs include all the statistics contained in InCompass' traditional simulcast programs, such as recaps; indexes on owners, trainers and horses; and statistical pages such as their Facts & Figures and Top 10 jockeys, trainers and horses. The format is identical to that of InCompass' most popular program layout and will soon be offered in additional formats and languages. The JHIS system stores jockeys' updated medical histories and enables medical personnel at participating racetracks to access that information quickly in the event a jockey is involved in an emergency on the track. Medical histories are available to first responders at the racetrack and also to emergency room physicians should riders require referral to a hospital for additional care. Prompt access to this information may expedite and improve the quality of medical care and sidestep impediments caused by potential language barriers, absence of jockey's family members, or severe rider injury. There is no cost for racetracks or jockeys to participate in the Jockey Health Information System. A regional representative of the Jockeys' Guild is available to provide assistance to jockeys and medical staff as are staff members at the Jockeys' Guild office in Lexington, Kentucky. This system was created in response to the Welfare and Safety of the Racehorse Summit to assist in building a database of injuries, both fatal and non-fatal, to later be analyzed to attempt to learn what factors may lead to injuries in racehorses. The EID system reads racing data from the RTO racing office system to eliminate the need for duplicate data entry of race information. The system has been expanded to included racing and non- racing injuries, training and backstretch injuries. Reports are available to vets and track management for quality control and analysis. This free service is a natural companion product to the Pre-Race Veterinarian Exam software offered by InCompass.